The August 21 total eclipse of the sun is already a widely-anticipated celestial event, and interest will likely only increase in the next four weeks. While the effects of the moon passing between the earth and the sun will be noticeable in most of the U.S., its full effects -- with daylight turning to nighttime -- will only be seen in a 70 mile wide strip that runs the entire length of the continent, from Oregon to South Carolina. No doubt most people with a clear shot at the eclipse will want to observe it, but NASA is cautioning that it needs to be done safely. Looking directly at the sun with the moon's shadow cast across it can cause permanent eye damage. 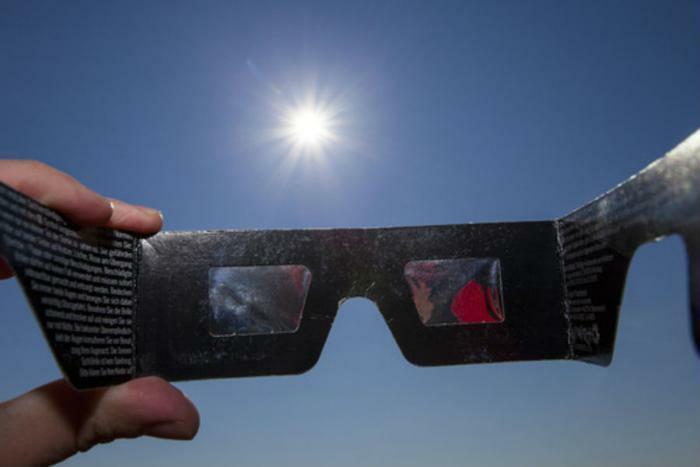 NASA says consumers should not view the eclipse with homemade filters or ordinary sunglasses. Viewing products should also be purchased or obtained only from known, reputable souces. Alex Young, associate director for science in the Heliophysics Science Division at NASA's Goddard Space Flight Center in Greenbelt, Maryland, says the space agency isn't trying to be the eclipse safety police. But the public, he says, needs to be cautioned about the potential dangers. “It’s important that individuals take the responsibility to check they have the proper solar eclipse viewing glasses. With the eclipse a month away today, it’s prudent to practice ahead of time,” Young said. NASA says as many as 6,800 libraries across the U.S. are distributing safety-certified glasses. Many of these local institutions are working with scientists to hold viewing events and activities before and during the eclipse. Southwest Airlines says it will give away viewing glasses to passengers flying on one of Southwest's flights on August 21 that the airline says will cross through the total eclipse path at the right time. In fact, those who plan to view the eclipse from the air are the only ones who pretty much have a guaranteed view. The only thing that could ruin nature's show is a cloudy, overcast day. At 30,000 feet, you'll probably be above any potential cloud cover.